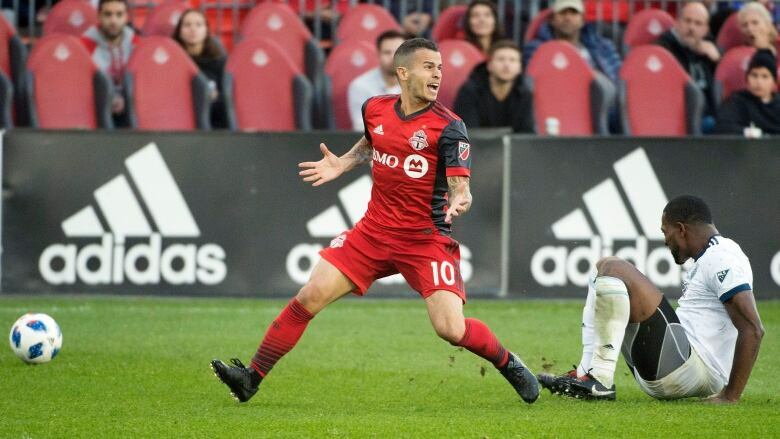 Sebastian Giovinco made sure he left Toronto FC on his own terms, turning to social media within hours of his sale to Saudi Arabia club Al-Hilal FC on Wednesday to berate the MLS club's handling of his contract impasse. Toronto FC president Bill Manning says he was both blindsided and disappointed by Sebastian Giovinco's parting shot on social media after the star Italian forward was sold to Saudi Arabia club Al-Hilal FC. Giovinco said via Instagram that the MLS club's "(contract) offer and lack of transparency is a clear message. It seems management prefers to focus on things other than the pure desire to win." Manning said he was blindsided because Andrea D'Amico — Giovinco's agent — had actually written a note thanking him when the transfer deal was consummated. He was disappointed because the TFC boss didn't feel Giovinco's take was an accurate reflection. "At the end of the day, I think it's a player (that) didn't get his way and he lashed out at the team," Manning told The Canadian Press on Thursday. The transfer deal came after a contract impasse interrupted the club's training camp in California. Giovinco, who turned 32 on Jan. 26, was entering the last year of a contract that paid him an MLS-best US$7.115 million last season. He made almost $28.5 million from Toronto in his four seasons here. TFC had a club option for a sixth year in 2020 but opted not to exercise it, believing it was above "market value" given Giovinco's age. "Recently, after refusing to exercise the club option for 2020, I was offered terms that I deemed unacceptable," said Giovinco. "They may say I left for a more lucrative deal, but this is not the case." That's somewhat confusing. If the Toronto offer was better than Saudi Arabia, why leave? "Exactly," said Manning. "In my opinion, you're not moving to Saudi Arabia for the lifestyle." Adding to Manning's surprise was Giovinco's statement: "I would have accepted less to stay in Toronto." Said Manning: "I'll tell you never once did Andrea indicate that the player would take anything less than he was currently making." The TFC president said the club came up from its initial offer, hoping to close the deal. Giovinco has signed a three-year deal with Al-Hilal, according to the Saudi club. Manning declined to discuss TFC's proposed term, saying only the Italian wanted a long-term commitment. He also declined to detail the transfer fee, other than to say the amount proved to be a hold-up initially. "We actually took a little bit less than we were planning on, to accommodate the player and his agent at the end to facilitate the deal," he said. A source pegged the transfer fee at $2 million to $3 million, which will go in its entirety to TFC. Asked if the club had received any offers from traditional soccer countries outside the Middle East, Manning said "zero." "We've had clubs call but once they found out his wages, there was no interest," he added. Given Giovinco could have signed a pre-contract with a new team in July, Manning said the transfer fee was "a return that was appropriate, as opposed to zero." Manning said he understood Giovinco's massive contributions to the league and Toronto — and the fact that it could be his last contract. "We had to look at it and say 'Are we prepared to invest this amount of money over this amount of time?' And we came up with what we thought was a price we felt comfortable with and at the end of the day they wouldn't take those terms." Asked to speculate what Giovinco will earn at Al-Hilal, Manning said: "I imagine it's a lot of money." With Giovinco and Spanish playmaker Victor Vazquez (sold to Qatar's Al-Arabi SC) both gone, there is a gaping hole in the Toronto lineup. The lone established striker left is Jozy Altidore, himself in contract negotiations with the club. Manning says the club will re-invest in an impact attacker. "I actually think you're going to see quite a bit of incoming (news) here in the next couple of weeks." Toronto opens CONCACAF Champions League round-of-16 play in Panama on Feb. 19 against Club Atletico Independiente. The MLS season kicks off March 2 at Philadelphia. Separate from the Giovinco departure, Toronto has signed U.S. international forward Terrence Boyd from SV Darmstadt 98 of the German second tier. Boyd's career has been hampered by a knee injury. The 27 year-old holds dual U.S.-German citizenship.